Happy Friday, friends!Is everyone excited for the weekend? I’m going to spend time with family, but outside of that I don’t have any specific plans. Thinking of making a fruit pie for Sunday (easter), but what else? Who knows. As promised, I made two recipes this week. I don’t have step by step photos since the sun was setting and I wanted to get this done— but the recipes are seriously easy enough where you can picture each step in your head without visuals. Promise. We make Indian food often. I think we make soups most around here, then Indian food probably comes in second. Well, Marlowe and I eat a ton of kale chips– almost everyday, but outside of that– its soup and Indian all the timeeee. Indian food can seem scary to make if you’ve never dived into it before, but its actually really easy. There are a few basic cooking rules when it comes to Indian cooking– but outside of that it’s usually just a quick switch up of spices or vegetables. 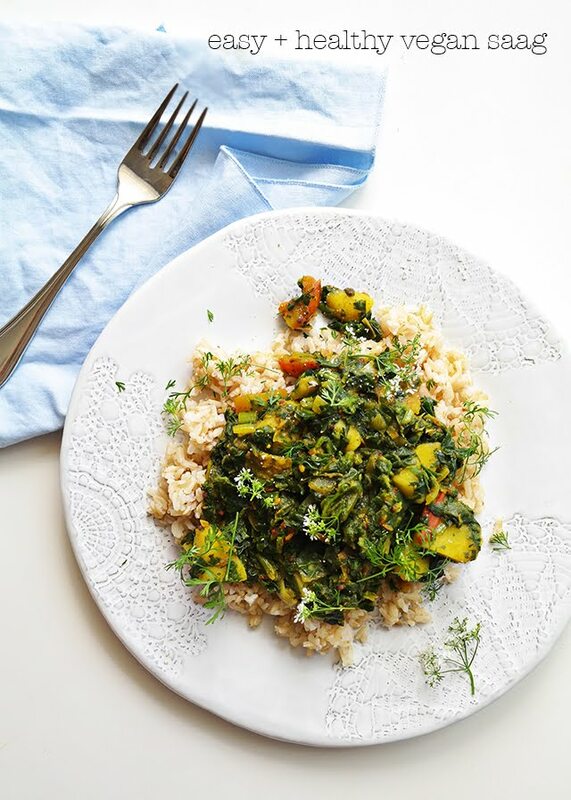 We like this saag recipe because it’s super tasty– and because almost all the ingredients should be right in your pantry! Frozen spinach has become a staple around here— it’s easy to have a bag or two stored away in the fridge for when you want to use them– and unlike fresh spinach you don’t have to stress about using the spinach right away. Keep it stored away for a rainy day when you’re looking for something healthy to make but lacking fresh produce. Grab that potato thats been sitting in the bowl, unloved and unused, and make some saag! Some of you may be asking, “wait, potato?” Well, yeah, sure! Saag is often times vegetarians dish, but not necessarily vegan. We use the potato in place of the paneer (cheese) or the protein like chicken. You can always use tofu too! I like using both, but have been leaning more towards the potato and saving the tofu for other dishes instead. So yeah, this isn’t the most traditional and authentic Indian dish– but it sure is tasty. Eat as is or pair it with an Indian feast! Spices! They’re super important! We have a cabinet PACKED with spices. 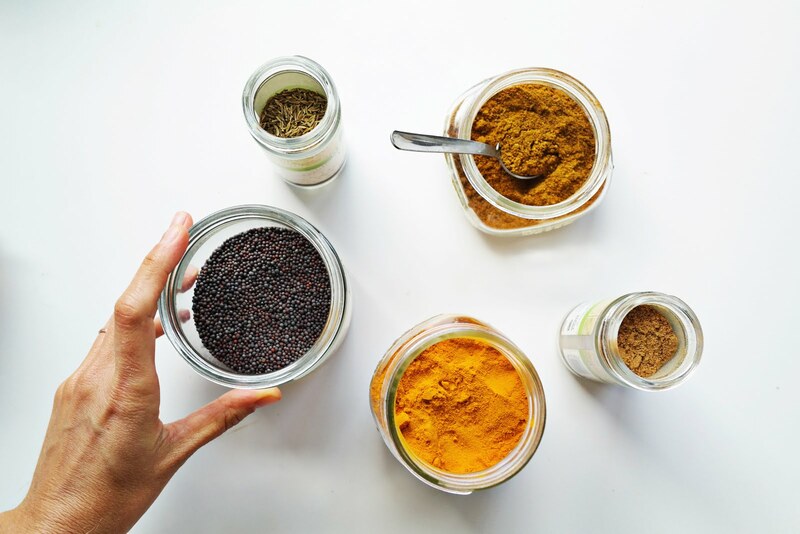 Not only are spices incredibly tasty, but their also REALLY good for you! They flavor a dish like nothing else— and you don’t need to worry about them going bad (not for a long, long time anyway). I mean, yes, fresh spices will pack the most flavor, but even spices that have been sitting around for a while will bring delicious and incredibly flavors to your dish. Most farmers markets will have a spice guy (or lady). If yours doesn’t,t you can always pop into an Indian market– and most supermarkets will of course carry a decent variety. 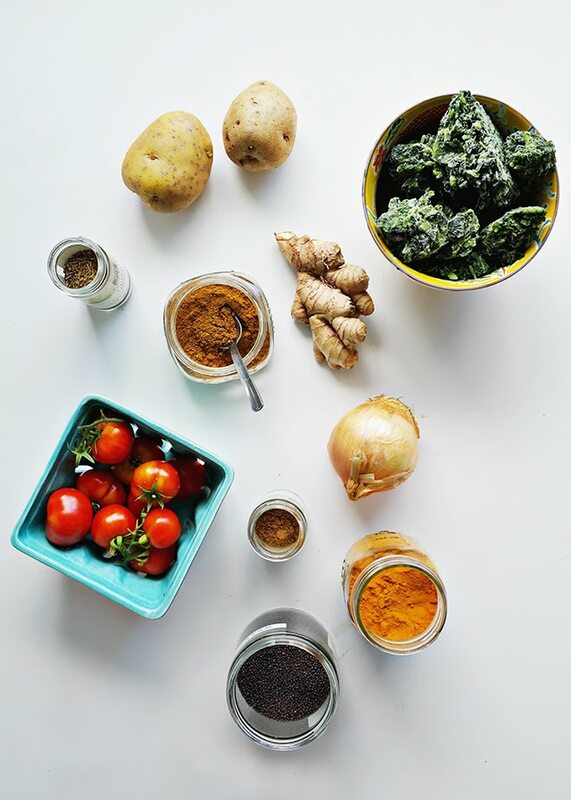 Be sure to buy pure, organic spices— you don’t want any binders, fillers, or salt in the spice. Just the pure spice, as is– and especially make sure that they are non-irradiated! (aka. you want spices that have not gone through radiation!) And of course, there is always the option of buying spices online. I like this brand a lot for online buying. They’re organic with no irradiation. We always buy whole spices, but if you do want o buy a blend, I like this company. Our spices are a mix from everywhere— farmers markets, the supermarket, the Indian market, and some we’ve bought in bulk online. I think it’s a very good investment to buy ten of your favorite or most used spices to keep on hand. Alright, ready to make some saag? *hing/asafoetida is an amazingly intense spice. It will stink up your entire pantry, haha. It’s a flavor like no other and hard to really describe, sort of musky, maybe? It is often times used in place of garlic and onions in a recipe. If you can imagine a recipe with garlic and onions and then without– it’s sort of like that. It just adds another level of flavor. It’s not a necessary spice, as this dish will still be good without it, but if you’re super into cooking and trying new foods, then you might want to check it out! It also has a ton of health properties! And it aids in digestion and is overall a great healer for your gut. But seriously, you’re warned– it’ll overpower your spice cabinet! **we sometimes add coconut milk to this recipe, sometimes now. I really like the coconut milk added in, it balances out the dish with a touch of creamy sweetness. If you have a can on hand, try it out, if not, water works too. ***coconut oil: so as you guys may or may not remember/know, I’ve gone mostly oil free. I’m working on a high carb, low fat diet right now. I use coconut oil often, but externally. I think the only time I really use oil for cooking anymore is for kale chips, thats it. Maybe you still love cooking with oils, well, if you do, then use the coconut oil to sautéed onions and toast your spices! -Bring a large pot to medium-medium high heat. Once warmed, (add oil if using) then add diced onions, sauté until translucent. If you’re not using oil, you may need to add a splash of water every few minutes so that your onions don’t stick to the pan. 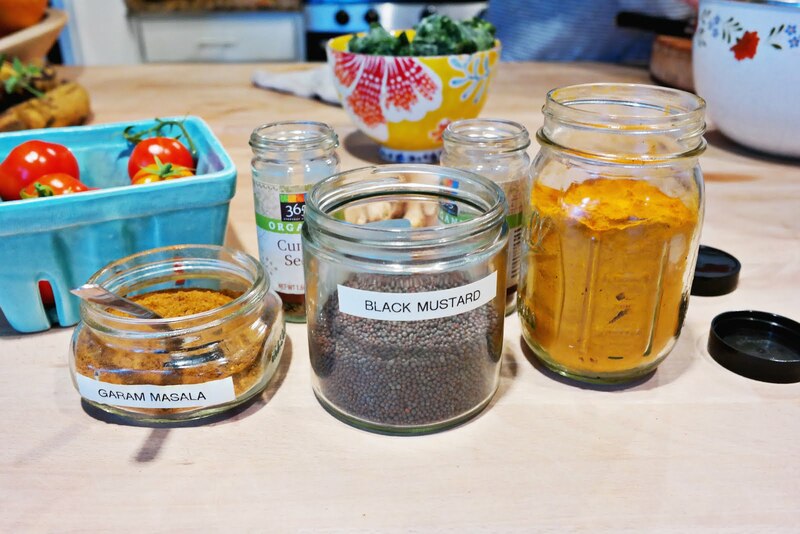 -Once translucent, add your whole spices (mustard and cumin) and allow to toast for about a minute, being careful not to burn. -Now add your ground spices, mix into pot. Add a splash of water if necessary. 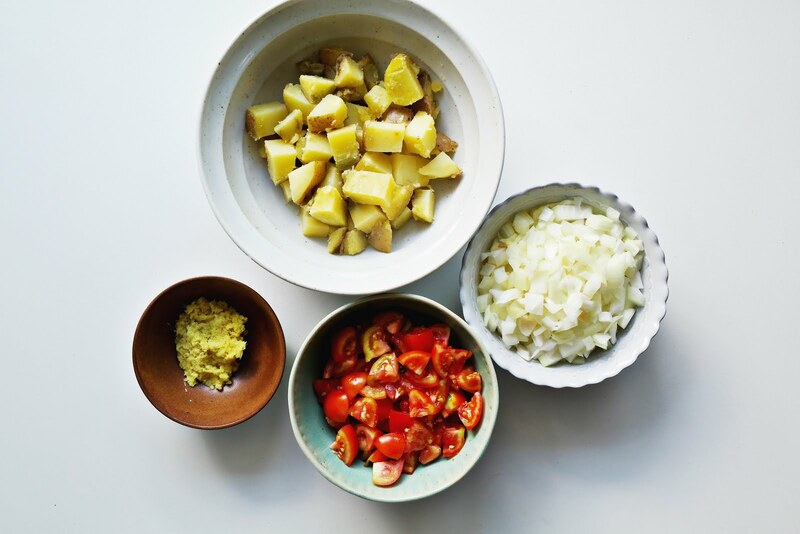 -Add your ginger and tomatoes and cook until tomatoes start to break down a bit. -And frozen spinach. Mix, then place lid on top for a minute to cook. -Once frozen has been mostly thawed you can add your liquid. Mix in either 1/2 cup coconut milk or 1/2 cups water. You can add more or less liquid to the dish– depending on the consistency you want. If we’re eating with rice, I tend to add a bit more liquid. Without rice, I like it a bit thicker. -Add potatoes and allow to simmer for a few minutes. Check to make sure it’s a consistency you like and salt and pepper to taste. Alright friends— I’m actually off to make more Indian food. We have leftover daal from the other night (we made a lot) and I’m going to make something else to pair it with for tonights meal. Ohhhh this looks fabulous! I think I'll make it this week. We don't have access to regular potatoes in Fiji so I made it with pumpkin. So delicious. Each time I make curry I don't seem to be get the spices balanced right but this was perfect. Thanks Drea. you don't?! Tell me more! Do you have sweet potatoes? I'm sure you have loads of squash then? I never knew this! We offer best photography Celebrate your wedding ceremony with best photography.